The Illinois River has always been central to Peoria’s history. Native Americans made their home by it for more than 12,000 years. When fur trader Louis Joliet and Father Jacques Marquette plied its waters in the late 1600’s, they discovered the richness of the area, and Peoria became a booming little river town. Today, Peoria’s RiverFront is a big draw, now an upbeat and bustling center for the arts, nature, dining and entertainment. Spend a few days here and you’ll be planning your next trip back. 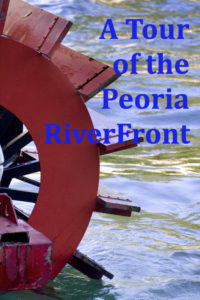 A good place to begin exploring is at the Peoria RiverFront Museum. A sleek, modern structure, it contains galleries, special exhibitions, and a great sculpture garden. It also features a Dome Planetarium that hosts special evenings, such as Laser Light Nights and Yoga Under the Stars. From here, walk over to the Caterpiller Visitors Center, a wonderful interactive museum that houses eight exhibit galleries and four theaters. A sign of the fun to come: tours begin with a virtual ride in a massive, 2½-story mining truck. To delve deeper into Peoria’s background, sign up for a History Tour on Fridays and Saturdays through October 28,2017. Or view the city from the deck of a riverboat on the Spirit of Peoria Moonlight Tour. Bring your bike for a ride along the RiverFront, or take stroll and enjoy a picnic sitting in one of the pretty parks. You’ll also find great dining in the RiverFront area—the Rhodell Brewery, Blue Duck Barbecue Tavern, and Café 401 are just three of many. A little known fact: the Peoria Symphony is the fourteenth oldest symphony orchestra in the United States. It begins its 120th season September 23 with performances in the Civic Center Theater, located just blocks from the waterfront. Spend a day in town exploring, then head out to the Old Church House Inn for a quiet night’s stay. The Inn’s history as a colonial church is evident in its 18-foot ceiling, arched windows, and loft library. The spacious guest suite features a whirlpool tub, separate sitting area, and an evening sweet, as well as a delicious full breakfast. Old Church House Inn is a member of the Illinois Bed and Breakfast Association … a unique lodging experience! 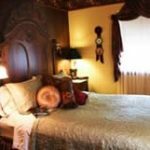 This entry was posted in History, Illinois Bed and Breakfasts, Local attractions, Museums, Touring Illinois and tagged History, Illinois Bed & Breakfasts, Peoria by admin. Bookmark the permalink.